Winnats Pass is a tough climb in the Peak District from the village of Casteleton heading West through a steep limestone cleft. It averages over 10%, with a considerable section of 20% + near the top. 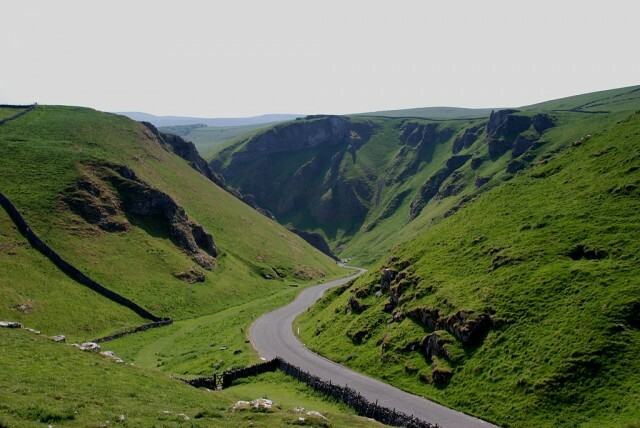 Winnats pass has featured in the now defunct Tour of Peak road race and also featured as a venue for the National hill climb Championship on four occasions (most recent 1977). There is now a popular Tour of the Peak sportive, run in May. 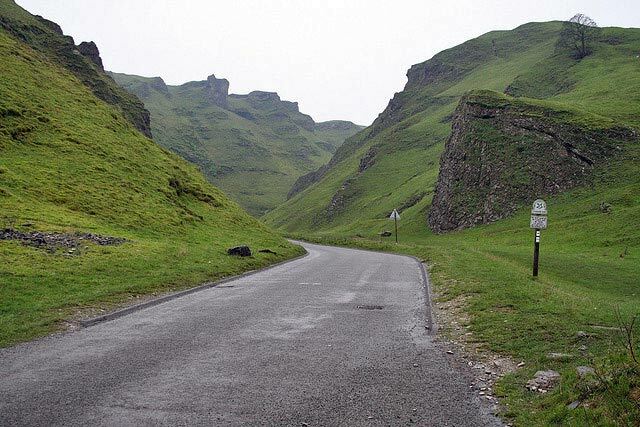 The sportive offers closed roads for Winnats Pass. The climb travels through a natural amphitheatre with steep slopes and rock faces on either side of the road. It provides an excellent location and challenge. 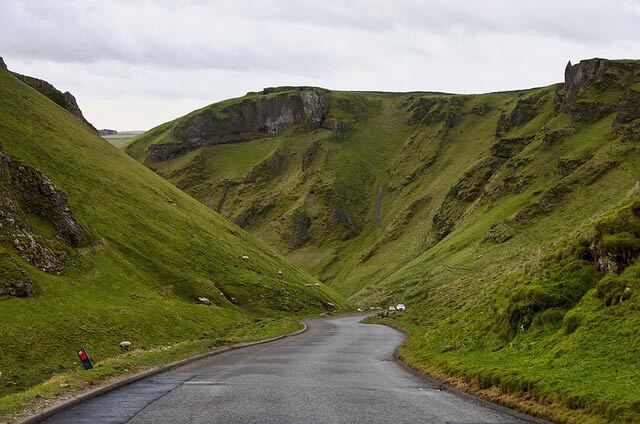 The main drawback of Winnats pass is that it can be quite busy with motor traffic. (unfortunately the old A road through Mam Tor was closed due to subsidence.) Combined with the narrowness of the road, it can become a little crowded. As a result, you are likely to be greeted with the reassuring smell of burning clutch as cars struggle up the 20% inclines. After leaving the village of Castleton you turn left. Initially, the climb is not too steep, but the gradient increases until you come to a fairly constant section of 20%, which lasts for quite a bit. 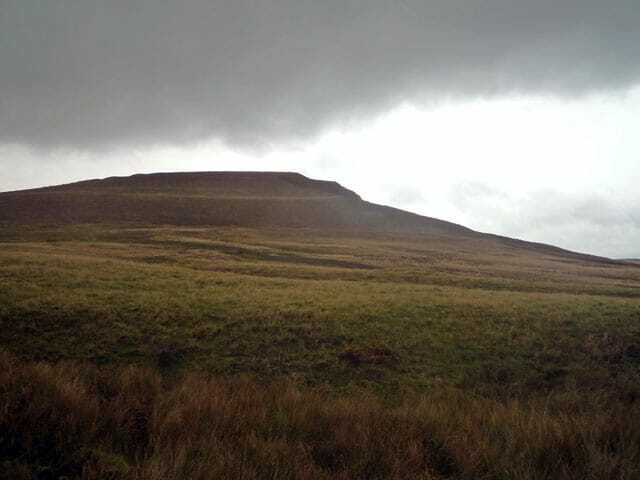 On the top of the moor, you see the quite impressive Mam Tor. The climb starts off at a gentle gradient as you leave the village; it steadily increases – up to 10% in the middle, and steeper towards the top. For a good section you have a gradient of 20%. Difficult if you went too fast at the bottom or if you run out of gears. There are also two cattle grids to negotiate. Finally, there is a false flat taking you to the top. One downside to the climb is that it is quite popular with motorists. Even motor cars can struggle a bit on the steep part, you might smell a whiff of burning clutch as you struggle up the last part. The road is wide enough for a bike and car, but with two cars passing it can get a little tight. Overall, it’s definitely a climb to check out. There is a good little circuit around Mam Tor, Edale and Winnats Pass if you wanted to get a few ascents in. The only time I have visited Winnats pass was after racing up Cat & Fiddle in September 2012. Starting in Macclesfield I went back up the Cat & Fiddle (much more slowly) and made my way over to Buxton against a fierce headwind. From Buxton, I took the road to Whaley Bridge, the opposite side of Long Hill, a climb I have frequently raced on. From Whaley Bridge I took a reasonable B6470 road to Chapel en Le Firth. A menacing black cloud was threatening in the distance, I was tempted to turn around, but wanted to reach Winnats pass if I could. The climb out of Chapel en le Firth was steady and long. Peaslows is just to the south, – a little steeper. With the afternoon getting dark, I made straight for Macclesfield. From Whaley Bridge I took the road straight to Macclesfield. It was more direct than the Cat & Fiddle. This was one of those unsatisfying climbs with many false flats and several sections. When you think you’ve got to the top, you descend before another section of uphill. The climbing is the same as the Cat& Fiddle, but the Cat & Fiddle gives a greater sense of achievement because it’s all done at once. Thanks for the great article. I think you missed out noting that the 1966 National Hillclimb Championship was also held at Winnats Pass. 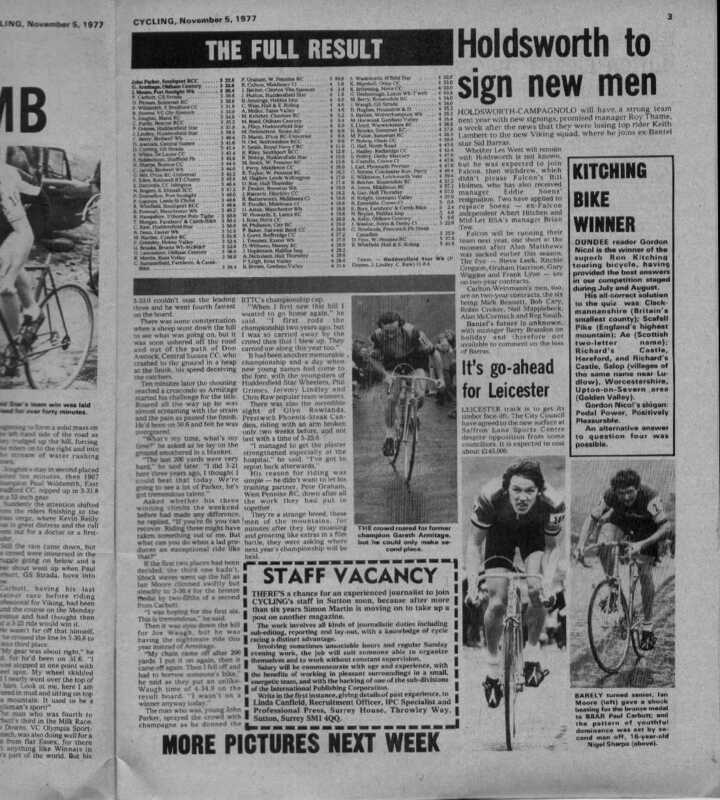 It was at this Championship that my father, Peter Michael Greenhalgh, riding for Nottingham Phoenix won the race in a still unbroken 3 mins 11.2 seconds. It seems appropriate for that to be included in this article. Unfortunately for cycling but fortunately for me he met my mother at the end of that year and the rest is history.